CSCI 221 with a grade of C- or better. MATH 207 (co-requisite or prerequisite). * Homework1, Homework2, Homework3, Homework4, Homework5, Homework6, FinalProject. Designers are not users by Jakob Nielsen, principal of Nielsen Norman Group. Heuristic evaluation involves having a small set of evaluators examine the interface and judge its compliance with recognized usability principles (the "heuristics"). See How to Conduct a Heuristic Evaluation, Usability.gov's Heuristic Evaluations and Expert Reviews, and Nielsen Norman Group's Heuristic Evaluation. Jakob Nielsen's "10 Usability Heuristics for User Interface Design"
Arnie Lund's "Expert Ratings of Usability Maxims"
Bruce Tognazzini's "First Principles of Interaction Design"
Ben Shneiderman's "Eight Golden Rules of Interface Design". The evolution of the desk - a thought-provoking, historically-accurate (almost) progression. Usability 101 -- How to define usability? How, when, and where can you improve it? Why should you care? This overview answers these basic questions. How to talk to users during a usability test - "Echo. Boomerang. Columbo." Silicon Valley HBO excerpt - the Pied Piper Platform Usability Test - "Totally Freaked Out" scene. Ten Usability Heuristics -- Ten general principles for user interface design. Also see tips for designing Web Interfaces. Progressive disclosure defers advanced or rarely used features to a secondary screen, making applications easier to learn and less error-prone, whereas staged disclosure provides a linear sequence of options, with a subset displayed at each step. Both are strategies to manage the profusion of features and options in modern user interfaces. NIME 2016 keynote lecture by Garth Paine - over the last two decades, the NIME community has seen an explosion of innovative and inspired ideas around the development of new musical interfaces. This lecture provides an overview of the field and important issues that emerge again and again, which may inform UI development in general. Also, here are photos of the lecture slides (since the video is a little grainy). What are personas and why should I care? - a quick intro from the Nielsen Norman Group. User personas - a user persona is a specific, imaginary example representing a set of real users - its an abstraction. As an abstraction, it focuses on the essentials, while abstracting away the unessentials. Getting the most out of personas - personas are great, but they are all too often under utilized, or worse misused. Find out some tips for creating and using your personas, so that you can get the most out of them. User personas - finding imaginary friends for UI designers. Creating negative personas - how to plan for failure and user frustration. Conceptual models in a nutshell - explains conceptual models and describes why its best to develop the conceptual model of a system before its user interface. User scenarios are the stories that your personas act out. Basically, user scenarios are thought exercises (though represented visually) in which you predict how certain types of users — represented by your personas — will interact with your UI in a given situation in order to complete a given goal. Use cases are written descriptions of how users will perform tasks on your system. Each use case outlines, from a user’s point of view, a system’s behavior as it responds to a request. Each use case is represented as a sequence of simple steps, beginning with a user's goal and ending when that goal is fulfilled. Paper Prototyping As A Usability Testing Technique - This article defines paper prototyping and explains how this technique can be used for usability testing. It is written mostly in bullet form to serve as a quick reference. 7 myths about paper prototyping - paper prototyping is probably the best tool we have to design great user experiences. It allows you to involve users early in the design process, shows you how people will use your system before you've written any code, and supports iterative design. Also see Paper prototyping helper kit. The 7 Best Prototyping Tools for UI and UX Designers in 2016 - choosing the right prototyping tool will maximize efficiency while minimizing effort (choosing the wrong tool will waste your time, in the long term). Get to know a tool, before selecting it. Things to consider are: learning curve, type of UI (website, mobile app, desktop app, other, all), fidelity (low (sketch, wireframe), high (flow, interaction)), sharing (collaboration with teammates, users), skills required (easy, hard, programming required, visual design required), and cost (free, or how much). How to choose the right UX prototyping tool - important thoughts on choosing the right tool for rapid prototyping of UIs. GOMS and KLM on WIkipedia. GOMS and Keyboard-Level Model (KLM) are modeling techniques used in interactive systems to analyze complexity in user interaction. Using the Keystroke-Level Model to estimate execution times. A deeper introduction to GOMS with a psychology basis. An even deeper introduction to GOMS for quantitatively predicting human performance on an interface design - focuses on notation and how to construct them. Card sorting is a relatively low-tech technique in UX design for using a group of subject experts or users to generate a taxonomy or hiearchical strucure of concepts or items. 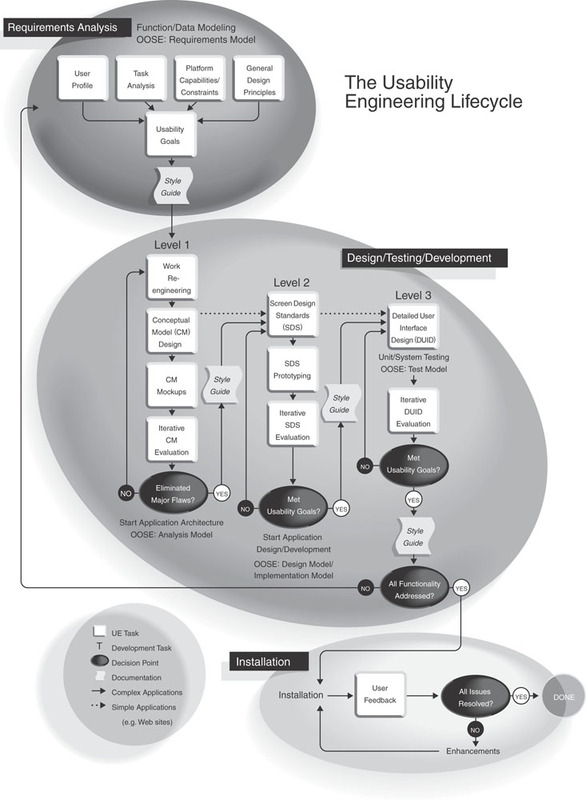 It is very useful for designing information architecture, workflows, menu structure, or website navigation paths. Card sorting: a definitive guide - Card sorting is a technique that many information architects (and related professionals.) use as an input to the structure of a site or product. Card sorting is a method used to help design or evaluate the information architecture of a site. In a card sorting session, participants organize topics into categories that make sense to them. They may also help you label these groups. To conduct a card sort, you can use actual cards, pieces of paper (and possibly software). Usability.gov - the U.S. Department of Health & Human Services website on all-things related to building useable products. Apple Watch "fails to excite" and is "a bit underwhelming" say designers - In April, Apple courted the design world by presenting the Apple Watch at a pavilion in Milan and holding a glamorous dinner for leading designers. So what do designers think of the product now – and why are so few of them wearing it? Also see Apple and Hermès unveil Apple Watch collection with handcrafted leather straps - The Apple Watch Hermès Collection marks the first time Apple has released a watch in partnership with another brand and reinforces Apple’s desire to position its smartwatch as a luxury product rather than a gadget. Lewis, C. and Rieman, J. (1994), Task-Centered User Interface Design - A Practical Introduction. Color Scheme Designer and for user interfaces.